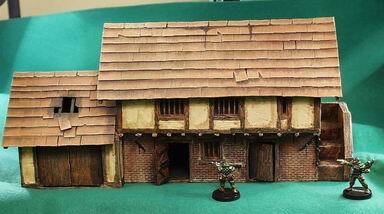 Crystal Caste: The Farmhouse "stable"
Measures 4Â” wide by 12Â” long. Main building has two swinging single doors on the front. Right side has exterior stairs that lead to a second story where there is functional door. Left side has large double doors for maybe a smithy or tack room. Removable roof too. This item cannot be shipped outside of the US.